Do you have a long list of favorite picture books? Maybe you come across new titles and wonder how you might work them in to your jam-packed schedule. 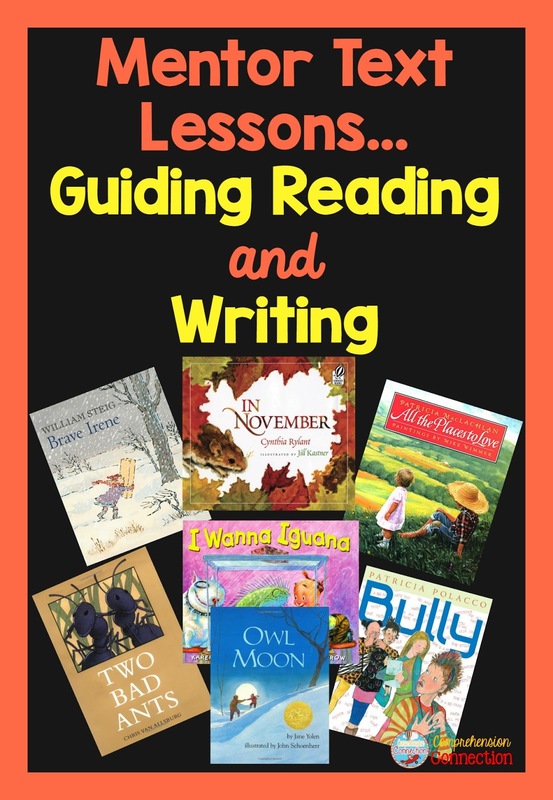 Well, mentor text lessons are the perfect way to build readers and writers AND highlight great literature at the same time.If you are not using this technique to teach your students reading strategies or are interested in seeing how someone else uses them, then this post is for you! 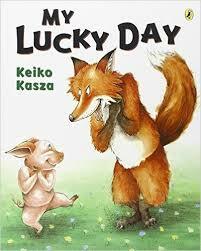 Today, I am going to walk through a lesson using one of my favorite picture books for this time of year, My Lucky Day by Keiko Kasza. When I begin using a book, the first thing I do is go through the book, and with sticky notes, I mark the talking points I plan to use. As I share the book, I build in plans to target specific comprehension skills and use the think aloud process to demonstrate them. To keep my students engaged in this process, I typically use a graphic organizer, group discussion, or interactive notebooks to have them do the work. I also use this time to analyze the author's craft and point out specific examples that highlight one of six writing traits. When using a text, I use a before/during/after process. Before reading, I involve my students in a schema builder to hook them and set the purpose for the lesson. This might include an ABC brainstorm on the topic, Give One, Get One, or maybe a Word Splash where students write words that come to mind when thinking about a topic. With this book, students are given a set amount of time for Give One, Get One. Since the book is all about trickery, they share tricks they've played on someone. I love Give One, Get One since students are actively talking and having fun. Once the time comes to an end, we have a group sharing session and I move ahead with my plan. With the books, I use a variety of presentation options. I use the book as a read aloud or if I have multiple copies, I use the book for guided reading. (since I teach in small groups). When I used this book last year, I used this video clip and stopped it at my talking points. As we watch the video clip, I use the column notes page to the right. Students are given text examples and asked to share what they think about the example. They make inferences about the characters and plot, and we discuss the author's word choice and style. The goal with this part is to help students observe (and hopefully imitate) the author's writing style later in their own work. We know students who are avid readers are typically strong writers too. So far, I've talked about the reading process, but now it's time for the writing process. During the writing block, I refer back to our reading lessons and what the students observed in the text. We work through the five steps in the writing process. For this book, I had my students write a story from the point of view of a turkey and tell how they were able to escape being roasted. The kids came up with the funniest arguments...too stringy, haven't had a bath in a long time, feathers are tough to remove, my meat is tough, and I have a loving family that will miss me are just a few of them. They practiced using dialogue and really focused on plot development. One student, who really struggled with reading, was completely into this assignment, and her final product was the best piece I saw from her in two years. (and I wish I had a photo of it to share). Here is a glimpse of the plan my students used to begin thinking through their story. As we work through the writing process, we continue to revisit the text during our reading block. Students build fluency in this way and practice comprehension strategies too. As a post reading activity, I always use a written response. Not every writing piece needs to go through the writing process, and it's important for students to be involved in writing across the curriculum through organizers, exit slips, quick writes, and journal entries. These units includes all of the materials you need for both reading and writing. 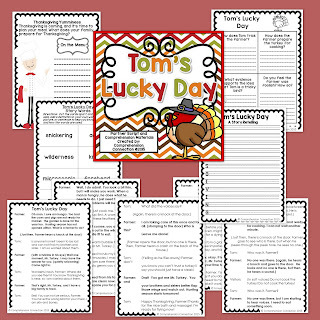 As an added bonus, I created a partner script on this theme too called Tom's Lucky Day which works well as an example of what the students will be writing. The characters in it are a farmer and Tom Turkey. However, students may choose a turkey and a fox or a turkey and a hunter,etc. 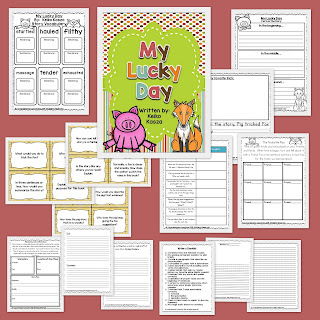 This set could be used in a Daily Five set up or during the guided reading segment of your schedule. You can check out both units using the previews below. Both sets are bundled at a reduced rate. During our language arts blocks, teaching critical thinking is a big task, and by using mentor text lessons, we move our students to the upper levels of Bloom's as they analyze the text and their writing. Earlier last month, I helped organize a mentor text blog hop for fall with other literacy bloggers. Those FREE lessons are all pinned to the Pinterest board below. Some lessons are for comprehension strategies only or for writing, but they will give you additional ideas (and resources) to try out. Follow Comprehension's board Mentor Text Lessons by The Reading Crew on Pinterest. What are your favorite picture books? What do you love teaching with them? I would love to hear since I want to give this bundle away! Share below in the comments, and I will choose a winner on Thursday when I post for Thematic Thursday. Of course if you just can not wait, I will let you choose another product of equal value. Have a happy day! I just heard recently about that book. Thanks for the thoughtful comment. Well...since I am a librarian, I have tons of "favorite" books. Today, we read "Wild about Books," by Judy Sierra. The librarian, Molly McGrew, drives her bookmobile into the zoo and gets all the animals excited about reading! Are you familiar with The Library Dragon by Carmen Deedy? What a great book! So many books, so little time, huh?? I have so many favorites it's hard to choose just one! One I like Weird Parents by Audrey Wood (and The Napping House because I read it a lot with my mom when I was young). It's fun to go with a family unit while also talking about being happy in your own skin (like I Like Myself). Thanks for sharing this book! Oh, Mary...love these! Audrey and Don Wood were at the National Book Festival this year! Sadly, it was before we arrived, so I didn't get to hear them speak. Napping House is an oldie but goodie! The winner of the set is Bex M who commented on my Facebook page. Thanks for commenting gals! This is an awesome post Carla! I love the sticky note idea. I should keep those in my boys' bedroom because every night when we are reading together, I can't turn my teacher brain off. I have to run downstairs afterward and write down my ideas. Ha!